No Wisconsin Dells Adventure is complete without a visit to America’s largest waterpark! With over 50 slides and attractions, Noah’s Ark is the place to go for thrills and spills. 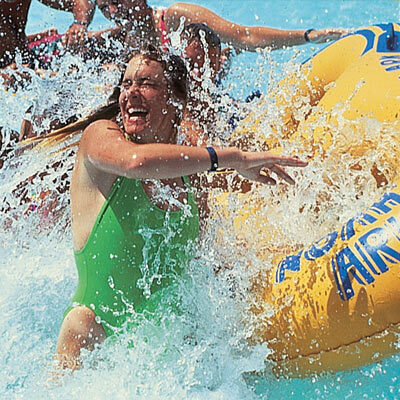 Experience all of the wet and wild fun, including The Scorpion’s Tail – America’s first looping waterslide, Quadzilla – a four-lane racing slide, Black Anaconda – a HUGE water coaster, two Endless Rivers, two GIANT Wave Pools, four children’s water play areas, bumper boats and a mammoth 4D movie theater. Located on 85 sprawling acres in the heart of Wisconsin Dells, Noah’s Ark is a cannot-miss place in Wisconsin Dells to bring your kids. Open Memorial Day weekend through Labor Day. Do not pass up this classic Dells attraction! When you buy passes to multiple attractions, you will not find tickets much cheaper than right here. Order online today!